Pyongyang, August 17 (KCNA) -- Kim Jong Un, chairman of the Workers' Party of Korea, chairman of the State Affairs Commission of the Democratic People's Republic of Korea and supreme commander of the Korean People's Army, with his wife Ri Sol Ju inspected the Wonsan-Kalma coastal tourist area under construction. 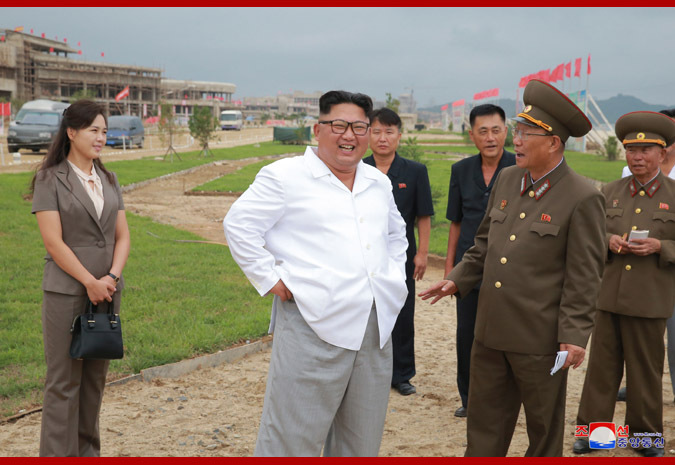 Looking at the general layout of the Wonsan-Kalma coastal tourist area, he was informed of progress in its construction project and went round the overall construction site, including a hotel, lodging quarters with cooking facilities, and service facilities, to acquaint himself in detail with them. Noting that buildings look separated and are little different from each other in height, he gave instructions to make the height of the buildings different, plan more hotels and service buildings of 30 and 25 storeys and ensure that the connection between buildings is more harmonious and peculiar, so as to polish the overall street layout in an artistic way. Highlighting the need to conduct well the afforestation and greening of the area, he talked about making a nice design for afforestation on the principle that trees of good species are planted to suit the surrounding ecological environment of the coast and doing the work of greening according to the plan. He pointed out that efforts should be made to construct infrastructural facility net in a qualitative way and that the construction should become a standard. Looking at the artificial ponds to which sea water was pumped, he said that the ponds should be well made to fit the surrounding environment and be looked natural, adding that the people will be pleased if angling sites and service facilities are placed around the ponds. He also gave instructions to provide all of necessary conditions, including first-aid stations at the sections of sea-bathing on the white sandy shore. It is the Party's long-cherished idea and his long-desired job to build wonderful recreational resorts on the scenic and beautiful shores of our country to let the people enjoy themselves to the full, he said, adding that now it will soon come true. Such a huge and grand creation campaign as the construction of the Wonsan-Kalma coastal tourist area is an acute standoff with hostile forces trying to stifle the Korean people through brigandish sanctions and blockade, a do-or-die struggle to defend the prestige of the Party and a worthwhile struggle for creating the happiness of the people, he said, and stated that if such magnificent project of large scale is completed surpassing the world's advanced level at such a difficult time as now, the strength of the single-minded unity of the Party, army and people will be displayed to the whole world once again and the coastal tourist area will be a very nice gift to our people. He called upon everybody to build the sea park without an equal in the world by keeping fortitude and strong courage and present it to the people as a gift on the occasion of Oct. 10 next year. Saying with a big smile on his face that Myongsasipri (4-kilomter beautiful sand) is likely to become Inpasipri (4-kilometer tide of people), he pictured to himself the appearance of the greatly excited people and school youth and children who will enjoy the new civilization of our times to the full under the benevolent care of the Party. Accompanying him were Army General Kim Su Gil, director of the KPA General Political Bureau, Hwang Pyong So, first vice department director of the C.C., WPK, Jo Yong Won, O Il Jong and Kim Yong Su, vice department directors of the C.C., WPK, Kim Chang Son, department director of the State Affairs Commission, and Ma Won Chun, director of the SAC.